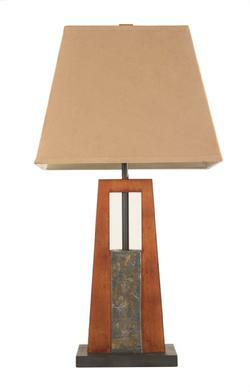 Attractive table lamp, gently tapering wooden rectilinear structure in light walnut finish. Composite center element; rectangular black base. Sueded fawn rectangular shade; matching square reverse tapered wood finial. 30” to top of finial; base 8.75”W x 5” deep. Bottom of shade 15.5”W x 9H. Excellent original condition with very minor wear.